Understanding the distribution, characteristics and dynamics of surface waters is of great interest for the ecology, flood prevention, water supply, construction engineering, etc. The detailed knowledge of the river discharge and the catchment area enables the calculation of the potential use for water supply directly from the river or from dams. Furthermore this data is essential for flood control management. River dynamics, which control the erosion, transport and deposition, are important for most aspects (as increasing sedimentation downstream and increasing erosion upstream a dam etc). Specific adapted hydrotechnics may optimize or restore the stream dynamic. Especially drinking water supply and environmental protection require exact data on the water quality (oxygen, salt concentration, chemistry of natural compounds and pollution, degree of euthropication, etc.) for integrated river quality management plans in the catchment area. KRIETER WATER & ENVIRONMENT plans and implements the surface water measuring programs and develops the integrated quality management. The water quality and chemistry is analyzed by best field and laboratory methods (details see our info-page “Water Chemistry, Pollution and Quality”). The traditional method to measure the surface runoff/discharge of a river is the flow gauge station. The advantage is the continuously measuring (monitoring) of the discharge, but the disadvantage is the very high costs for construction and maintenance. Additionally at least some years for construction and data calibration/correlation (actual water level versus discharge rate) are needed. KRIETER WATER & ENVIROMENT is using the special mobile ADCP-technic (Acoustic Doppler Current Profiler) which is a velocity area method using a small boat (also operating by remote control) or towed small platform to traverse the river to make a measurement of discharge by the acoustic Doppler principle. Especially in those areas where no or only very few discharge data is available, the ADCP research system is the method of choice. 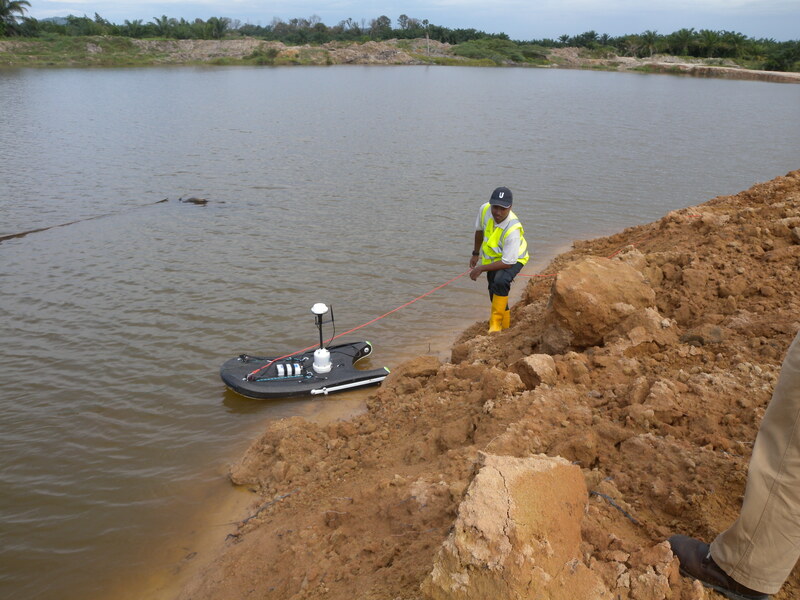 The ADCP method enables the measurement and calculations of the water depths, river bed profile, discharge and suspension transport rates.